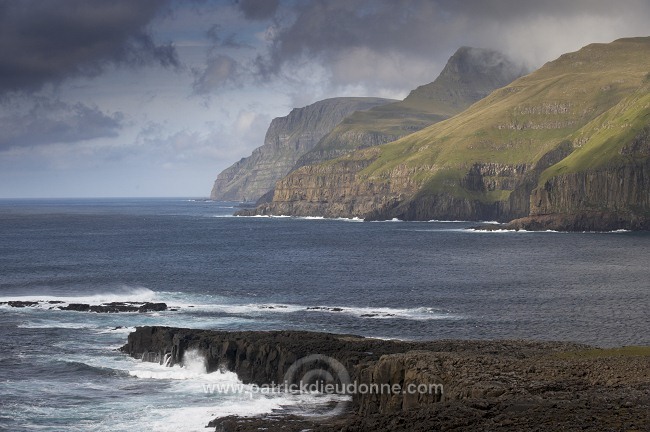 Description: Sea cliffs and surf near Famjin (Logvatangi, Brimnestangi), on Suduroy west coast, Suduroy island, Faroe islands (Faroes), Denmark, Europe. - Falaises pres de Famjin (Logvatangi, Brimnestangi), cote ouest de Suduroy, Iles Feroe, Danemark, Europe. - Format: digital, Nikon D3 full-frame professional DSLR - 58 Mo tif files. - Format: digital, Nikon D3 full-frame professional DSLR - 58 Mo tif files. Caption Sea cliffs and surf near Famjin (Logvatangi, Brimnestangi), on Suduroy west coast, Suduroy island, Faroe islands (Faroes), Denmark, Europe. - Falaises pres de Famjin (Logvatangi, Brimnestangi), cote ouest de Suduroy, Iles Feroe, Danemark, Europe. - Format: digital, Nikon D3 full-frame professional DSLR - 58 Mo tif files. - Format: digital, Nikon D3 full-frame professional DSLR - 58 Mo tif files.